General awareness is a very important segment, in order to clear banking exams. It checks the candidates’ awareness of banking affairs, national and international issues, news on economies, etc. This section basically aims to check the candidate’s awareness of the latest banking and non – banking happenings all around with a special focus on banking awareness. 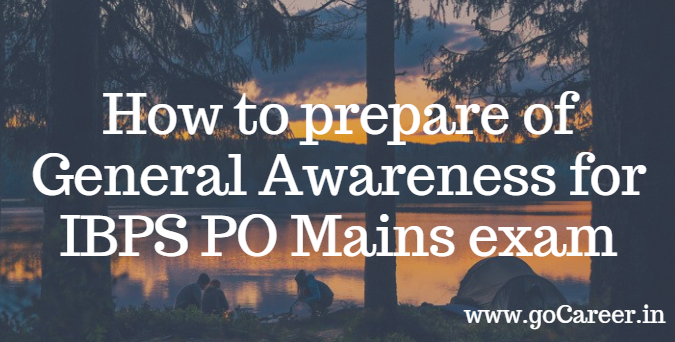 The syllabus for IBPS PO (General Awareness section) is vast, so a smart approach is needed to score well in the General Awareness section of the IBPS PO Mains phase. One can score around 85 – 90 % in this section thus forming a strong base in overall selection. 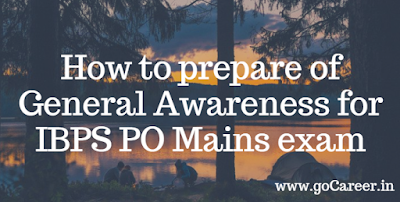 Let us now have a look at some important tips and tricks that will help you prepare the General Awareness section for IBPS PO Mains exam in a very effective manner. 1. Go through the previous year papers. The pattern usually doesn’t change for this particular section. So, thoroughly analyze the type of questions that are commonly asked in this section and prepare accordingly. 2. The main focus should be based on Banking awareness. So prepare the various bank’s tagline, bank`s board members, bank`s headquarters, etc. Also, prepare well for the various banks in news. Questions are also asked from NBFCs, international organizations of this field etc. Sometimes questions are also based on insurance sectors. So, prepare the A to Z of banking like the various terms involved in internet banking, fund transfer, etc thoroughly. 3. Prepare well the current affairs of at least last 6 months. Banking awareness not always includes banking news but the news that has both national and international relevance. Also prepare the various sports in the news, the person in news/awards, latest appointments, government latest schemes, etc. 4. Questions are also asked from static GK. This can be related to countries, trophies, players, capital, currencies, dams, parks, etc. Questions from this section might or might not be asked in the exam. So one must not completely rely on the same. 5. Don’t just mug up everything. Use the internet and browse whatever you don’t know. Dig more and more for facts and information. This will ease your learning process and at the same time, will provide you with other important information thereby connecting the dots between 2 or more news. 6. Questions on banking awareness include the various subparts like banking and its history, various reforms, monetary instruments, financial system, Basel norms, financial organizations, etc. This preparation is a one-time preparation as such facts and figures don’t change with the passage of time. So, invest much time in this and prepare thoroughly. 7. Go for continuous revision each day as questions might sound confusing and similar. So, think before marking. Browse the question well and think of what is being asked. Don’t create unnecessary trouble for yourself by guessing the answers. Do what you know is right. 8. Go for the daily reading of newspapers and other GK related books. Increase your reading speed. Select a good newspaper with valuable information. Reading complete newspaper is not paramount. Reading what is important should be your utmost goal. Watch news on a regular basis. Prepare short notes for the exams. 9. There is no grey line between the black and white as there are only two possibilities i.e. either you know what the answer is or you are not aware of what is being asked. No calculations are involved in the same. 10. This section is basically asked to check the candidate’s overall learning skills and capability to grasp new things. It usually measures how a candidate manages when there is information overload. It is a choice between what to learn, provided with a vast amount of information. So, go for smart work. Not everything given in the newspaper, articles, and magazines is important. Select relevant things from examination point of view and go ahead. 11. Practice online quizzes on a regular basis. This will fill the gap between what you are learning and what is actually being asked. This will also show you where you stand, this will act as a mirror to judge your performance. After analysis, you can review yourself and prepare further accordingly. IBPS PO exam has General Awareness section only in the Mains phase which consists of 40 questions with each question carrying 1 mark. One needs to solve the questions in 35 minutes which is more than sufficient. So you need not hurry about the running time and mark the answers after reading the questions thoroughly. Don’t forget this section can increase your overall score thereby raising the chances of getting the final selection. So, prepare well and give your best in the exam! You can also download gradeup IBPS PO preparation app from Google Play Store.